Industrial washing machine which is produced in Nieros is cost-effective, has optimal water consumption and efficient energy use, it also complies with various standards such as HACCP, NSF and IFS. 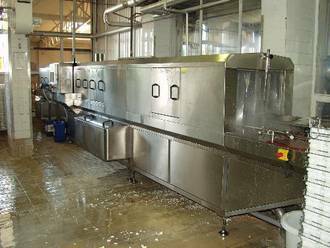 In many industries an optimal hygiene is a must, especially in food processing industry. Optimal industrial washing machine needs to have high performance, efficiency and quality. With Nieros washers, various items can be washed thoroughly and quickly. Multipurpose or specialized machines for sale are made for cleaning standardized items such as boxes, racks, euro pallets, euro crates, trays, euro bins, moulds. Cleaning machines for sale can be fully customized to meet all client’s requirements. Furthermore, Nieros offers customized solutions to meet every client’s need. Beside multipurpose and item specific washers, company provides fully customized solutions which are designed and developed according to expectations and needs of client to achieve superior performance. 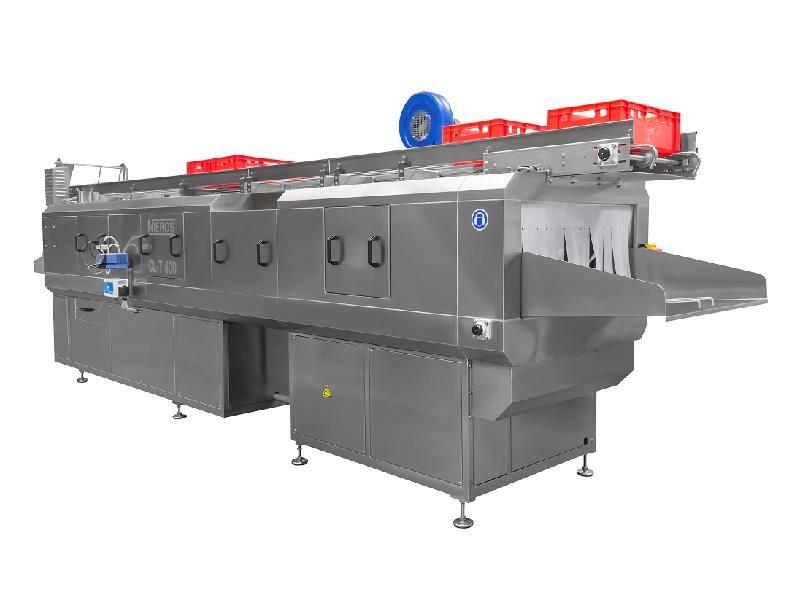 Professional washing machine can be integrated into automatic conveyor systems. Cleaning process begins with a thorough wash and rinse of items, then they undergo initial drying before they are transferred to a blow-off tunnel for complete drying. Sanitation phase follows and after that, items are transported to the warehouse by fully automated warehouse system. Industrial washing machine manufacturers Nieros produce multipurpose industrial washers which are the best solution for companies with diverse items to be washed. They are available in tunnel or cabin version. Crate, bin and pallet washer is equipped with automatic swing lift for loading and unloading. It is suitable for 200- or 300-liter bins, pallets, euro crates, utensil baskets and various containers. They have easy and convenient access to water tanks and spray nozzles. Pallet box and bin washer is cabin washing machine for sale which also sanitizes items for superior hygiene. It has safety guards and light beams in loading and unloading area. Utensil washer is another multipurpose machine for pharmaceutical, food and other industries where superior hygiene of equipment is required. With automatic cleaning and sanitization with 85° hot water it washes laboratory equipment, knife baskets, pallet boxes, euro stacking containers and other items. Nieros industrial washing machines are produced in cabin or tunnel version. They are used for cleaning items with similar size, shape and material. To accommodate wide range of items, they have sideguards and hold-down attachments. Item specific washers for crates, trays, pallets ensure best cleaning results. Crate industrial washing machine has cleaning and rinsing zone. It features adjustable washing and rinsing functions, object detection sensor in rinsing zone, adjustable nozzles. Industrial washing machine for sale can be fully customized, options which are available are: stacking device, steam water heating, blow-off tunnel, vapour extraction fan and many more. IBC washers are designed to provide superior cleaning of IBC containers. They can accommodate up to 80 containers per hour. Upgrades which are available for this machine for sale are: adjustable nozzles for exterior cleaning, blow off nozzles for drying and lid removing robotic arm. Pallet washer is another item specific cleaning machine which effectively washes plastic and metal pallets, trays and other comparable items. Nieros specialized industrial machines for sale are suitable for any cleaning process which aims towards superior performance. They are combined with other machines and are indispensable in industries such as bakery, fruit and vegetable, chemical and other sectors. Machines can function as independent unit or are a part of broader washing system. Sticker remover machine is suitable for removing stickers from crates, using high pressure which is created with two 150 bar high – pressure nozzles. Blow off machine complements any washing process. It removes residual water from the items.